A strudel is a type of sweet layered pastry with a filling inside, often served with cream. It became well known and gained popularity in the 18th century through the Habsburg Empire. Strudel is most often associated with the Austrian cuisine, but is also a traditional pastry in the whole area formerly belonging to the Austro-Hungarian empire. Austrian cuisine was formed and influenced by the cuisines of many different peoples (Turkish, Swiss, Alsacian, French, Dutch, Italian, German, Bohemian-Moravian, Hungarian, Polish, Croatian, Slovenian, Slovakian, Serbian, and Jewish cuisines) during the many centuries of the Austrian Habsburg Empire's expansion. 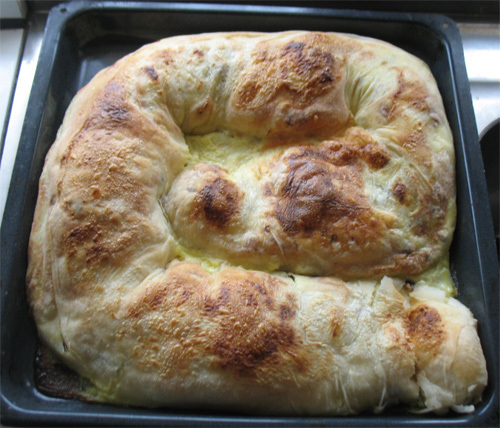 Strudel is related to the Ottoman Empire's pastry baklava, and came to Austria via Turkish to Hungarian and than Hungarian to Austrian cuisine. "Strudel," a German word, derives from the Middle High German word for "whirlpool" or "eddy". Left: Home made old fashioned Apfelstrudel in the oven, rolled up and filled with apple filling. 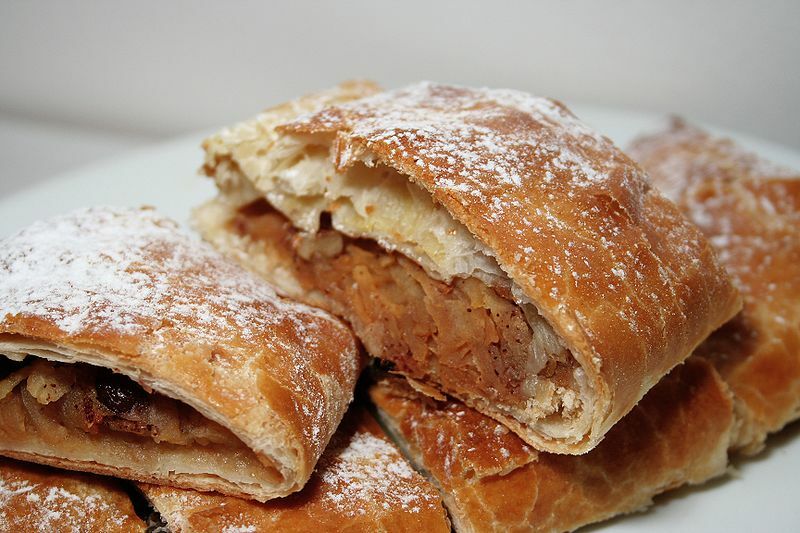 Apple strudel consists of an oblong strudel pastry jacket with an apple filling inside. The filling is made of grated apples, sugar, cinnamon, raisins, and bread crumbs. A juicy apple strudel should be baked with good cooking apples that are tart, crisp, and aromatic. According to the famous chef Karl Gundel (1883 – 1956), for apple strudel, winesap apples are the best. The dough consists of flour, oil (or butter) and salt. The secret of apple strudel dough preparation is in making the pastry very thin and elastic. Preparing of the original strudel dough is a difficult process that appears complex. The dough is kneaded by flogging often against a table top to align the starch molecules but if it appears to be thick and chuncky you must throw that dough away and make some new kind, rested, then rolled out on a big table, so it should cover the whole table, and then stretched by hand on a floured tablecloth. It is best to use a rolling pin. The dough should be very thin, and holes are mended if any occurs. When the dough is finally stretched out, an old fashioned apple strudel dough is very large, and often may reach the size of a bedsheet. A single layer should be so thin that one could read a newspaper through it. Apple juice can be added to the pastry dough instead of water, and the dough may be substituted using frozen phyllo dough. Vanilla and rum may be used to add flavour to the filling and light flavoured olive, or other oil may be used instead for butter or lard. Other less usual ingredients may include zest, lemon juice, and nuts (preferably ground walnuts, slivered almonds, or in Italy, in Trentino Alto Adige, pine nuts). Before baking, it is best to sprinkle brown sugar and cinnamon over the top coated with either butter or olive oil. 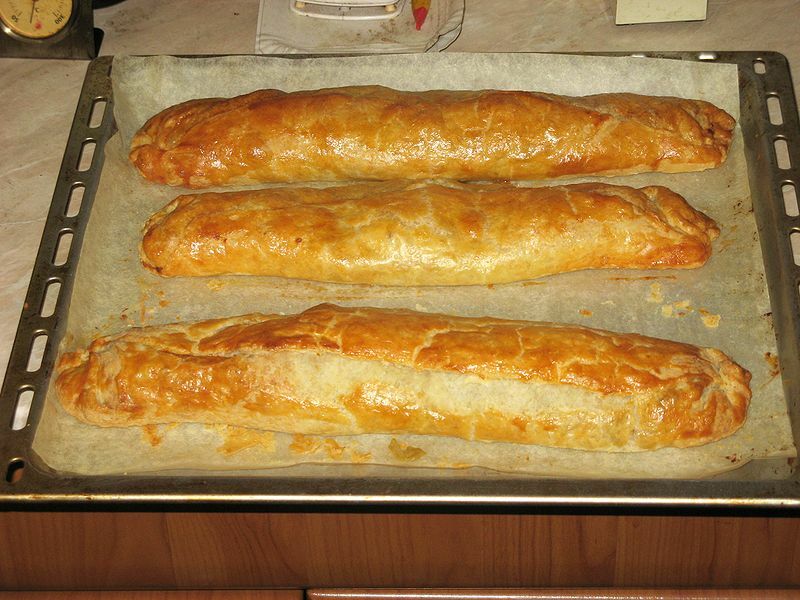 The rolled-up and filled apple strudel is baked in a pan in the oven. The apple strudel is sliced and traditionally is served warm, often sprinkled with powdered sugar. Left: Strudel baked in the oven. Toppings of vanilla ice cream, whipped cream, custard, or vanilla sauce are popular in many countries. If the strudel is cooked right, you won't need any toppings. Apple strudel can be accompanied by tea, coffee or even champagne. Viennese café is a typical institution of Vienna that has a long tradition in Austria and plays an important role in Viennese culture and culinary tradition. The one of the most common treats in a Viennese coffeehouse is Apfelstrudel with coffee or tea.